On the intersection of East and West, the Latvian capital’s history of mixed fortunes is bound to captivate explorers of the Baltic. 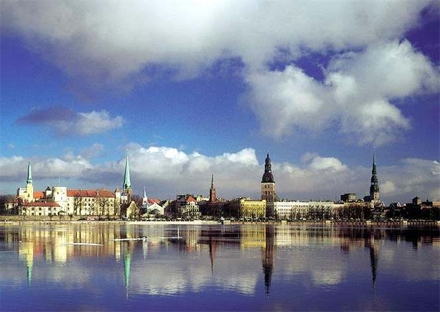 Once a bustling merchants’ town in the Hanseatic League during the Middle Ages, the biggest city in the Baltic was subject to the whim of foreign occupiers throughout the twentieth century. 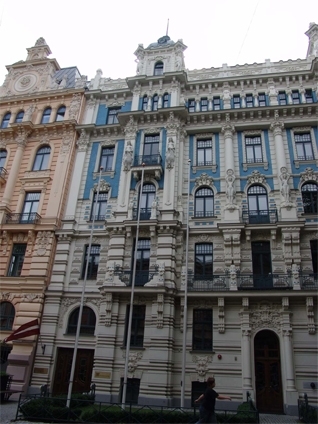 Mindful of its troubled past, the Riga of today combines the rich traditions of its culture with the wonders of its Jugendstil architecture. Built in a frenzy during its industrial heyday, Riga’s diverse architecture makes it the veritable art nouveau capital of the world. Exponents of the style, like Jewish architect Mikhail Eisenstein, have left their mark as gargoyles galore and floral maidens adorn picture-perfect house fronts all over the city. Lining the Daugava river, Riga’s compact city center offers a dive into the past. Most notable is the House of the Brotherhood of Blackheads. Bombed to ruin during the Second World War, reconstruction efforts have left a beautiful replica that harks back to a time of guilds and merchant debauchery. The nearby Cat House is also worth a detour. Legend has it that a wealthy tradesman who commissioned the building, wishing to join the Brotherhood of Blackheads, was denied membership. To demonstrate his disgust at being rejected, he is said to have installed two copper statues of cats on the roof with their back ends, tails aloft, facing the guild! In remembrance of the country’s invaded past, a visit to the Museum of Occupation of Latvia brings some refreshing historical perspective in the former headquarters of the KGB. From exhibitions detailing the brutality of the Nazi regime to daily life under the Soviet spotlight, a candid view of the Latvian nation’s story bears all. Riga is also one of our many port destinations. If you plan to come to your guided tour(s) by cruise ship, we would be more than happy to arrange for your transfer and arrival! Delve into the mysteries of medieval folklore, admire the architectural diversity and much more in the Latvian capital with Milk and Honey Tours. Top off your journey through the Baltic countries with our tours in Vilnius and Tallinn. Our friendly guides cannot wait to greet you! If you would like more information on our private tours in Riga, please fill out the form below - or call us directly under +49 30 61 62 57 61. Walking tours starting at 400 EUR for 4 hours - Driving tours starting at 420 EUR for 3 hours.